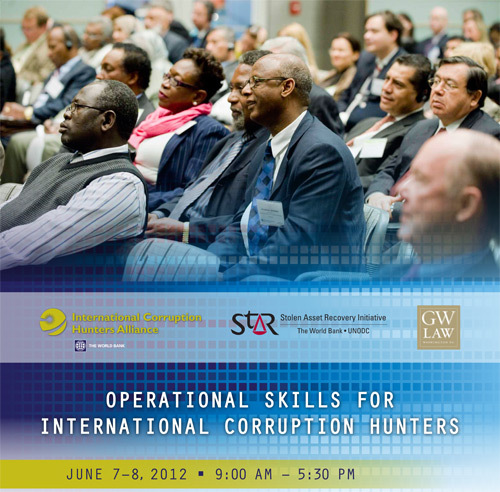 Jack Smith, Thomas Lasich and Hari Mulukutla delivered a two-day workshop called “Operational Skills for International Corruption Hunters – International Corruption Investigations” under the auspices of second biennial meeting of the International Corruption Hunters Alliance at the World Bank in Washington, D.C. on June 7-8, 2012. The workshop included a simulated case exercise covering subjects such as money laundering, asset tracing and recovery and the use of open source intelligence for evidence gathering. 100 officials from dozens of countries and Interpol participated in the workshop and actively took part in solving the simulated case. ICHA’s meeting theme was on international cooperation, technological innovation, regional priorities and transnational enforcement. The George Washington University Law School, The World Bank and Repatriation Group International, a not-for-profit organization co-sponsored the workshop. The success or failure of every anti-corruption program depends upon political will, appropriate legislation and credible enforcement capabilities. This workshop is an “active learning” exercise that focuses upon enforcement capabilities and requires countries affected by corruption to work together with financial-center countries to resolve obstacles commonly encountered in tracing and recovering the assets of corruption. Participants will use an array of anti-corruption tools that can be applied in their home countries for use in individual cases as appropriate.